There was a connection with these two; for obvious reasons in some ways (Ashley and I graduated high school together), and for some less obvious reasons. Creative people crave comfort and connection in our everyday lives. This might mean a lot of different things for a lot of different people, but at the end of the day, we all are looking for a feeling of ease and simplicity within our chaotic, creative minds. Ashley (owner/operator of Tanzen Designs) and Joe fell easily into step at their engagement session and we all knew right away that their wedding day would be a mirrored effect. So it was, and so it shows in their beautiful spread in the Winter edition of The Knot: New England Magazine. I love this publication! I always send special weddings to be published with The Knot New England because they support and show love for small town, local vendors. 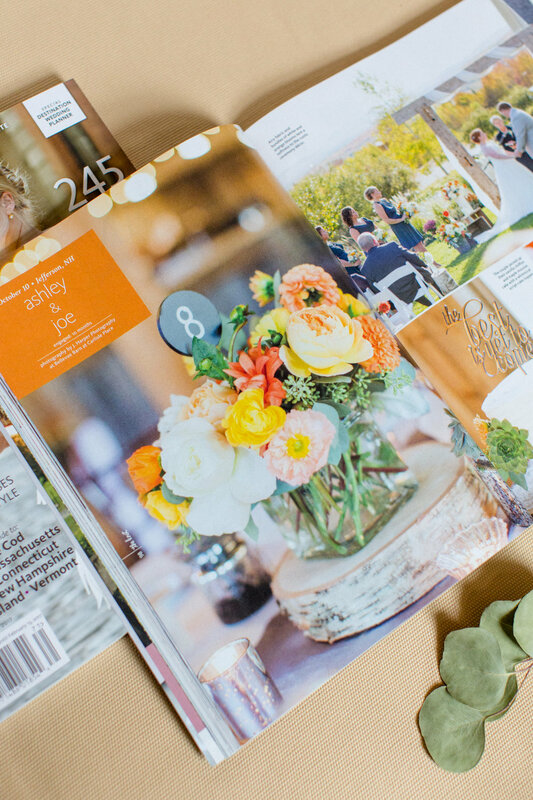 It's a small world within the wedding and event industry, and just a slice of the pie is photography, so when a big time magazine recognizes the hard work of those of us tucked away into rural America, I can't help but sing their praises! I hope you got your hands on a copy of this gorgeous issue, and keep your eyes out in June for Ingrid + Charlie's pastoral soiree in the hills of my neck of the woods, The Northeast Kingdom of Vermont.